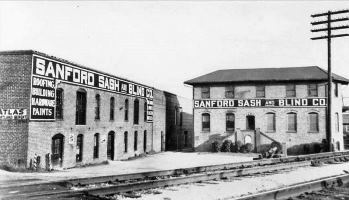 Last week we spent some time revisiting Sanford’s origins as a “train town,” and made mention of the many rail lines, companies and residents who played a role in our community’s growth and evolution. 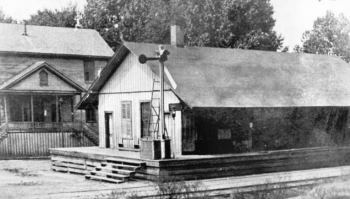 Naturally, there’s a lot more material to cover than one week’s worth of remembrances, so this week’s feature continues heading down the same “track,” beginning with a look at the depot area and a much different looking downtown area from just after the start of the 20th century. Last week we noted that the convergence of railways in Sanford made our community an appealing place to do business right from the start. Many emerging companies placed their operations right beside the railroad tracks for obvious means of convenience. One early adapter of this concept was Sanford Sash & Blind. 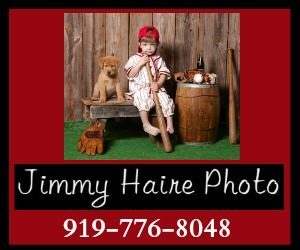 Founded in 1882, this company made all sorts of products from area timber. When we think of “train depots” in the area, our eyes instinctively turn to downtown Sanford, but for many years our metropolitan area was home to 2 flourishing train stations. 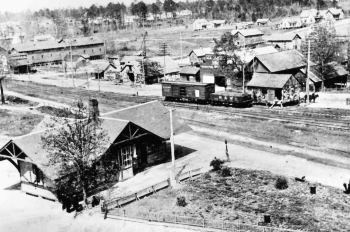 The Jonesboro railroad depot was located at the intersection of Fayetteville and Raleigh Streets. In this picture from the early 20th century, we can also see the Jonesboro Town Hall in the distance. Here’s a look at the inside of the train depot from around 1920. The attendant in this picture is Mr. C.H. Russell. 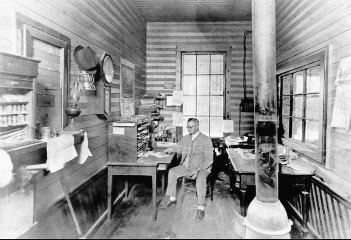 Activity in the first part of the last century was so significant at the Jonesboro Depot, that when Lee County was founded in 1907, planners decided to place the new county courthouse halfway between the train stations in Jonesboro and downtown Sanford. Our next view is of the Seaboard tracks in downtown Sanford around 1950. This is at a time when the impact of railway travel as a whole, and in Lee County specifically was beginning it’s gradual decline. What’s notable in this picture is the small signalling tower. 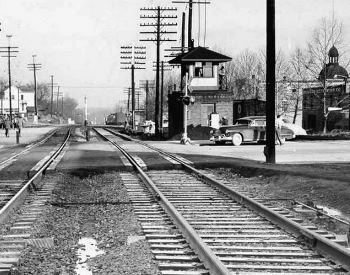 In an era before automatic train signals and crossing barriers, the “signalman” in the tower manually activated the warning signals any time a train was on its way to the intersection. 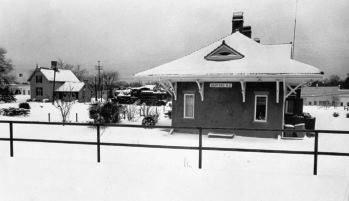 Finally, this week’s weather may almost be summer-like, but let’s wrap up our episode of train-oriented time travel with a distant look at a snowy depot in downtown Sanford. A glance to the background reveals a time and place that was much less developed than what we see today with Depot Park and surrounding downtown businesses.